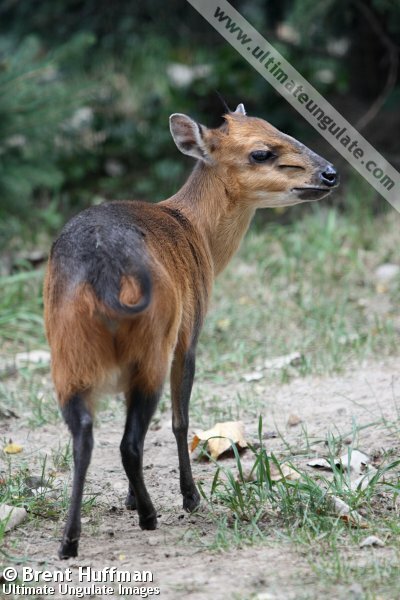 The red flanked duiker is a small, stocky duiker with a rounded back. The body is bright foxy red, with a wide bluish-gray band along the spine that extends from the shoulders to the rump. The short legs are also bluish-gray in color below the line of the belly, as is the tail, which has a black tuft at the end. A dark blaze runs down the centre of the face; the muzzle and lower lip are dark, and the upper lip and underside of jaw are contrastingly white. The ears are large and the dark forehead is topped with a tuft of black hairs. A very prominent slit in front of each eye is the opening for the preorbital glands. 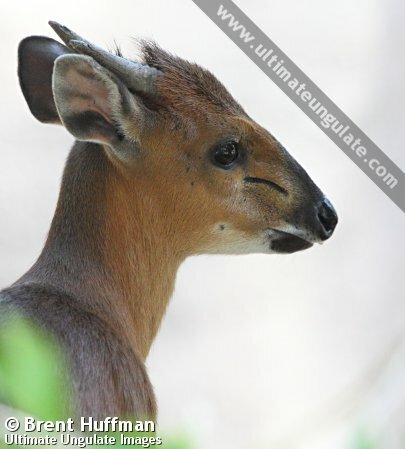 The horns of the red-flanked duiker are spike-like and point backwards. In males, they grow 6-9.5 cm long; in females they are much shorter (3-4 cm) or absent entirely. In the field, "red duikers" can be a challenge to distinguish, although the red-flanked duiker is easier than some on account of its very wide dorsal stripe, dark legs, and savanna-dwelling nature. The bay duiker (Cephalophus dorsalis) is nocturnal and has a sharply-defined black dorsal stripe that extends up the neck to the back of the head. 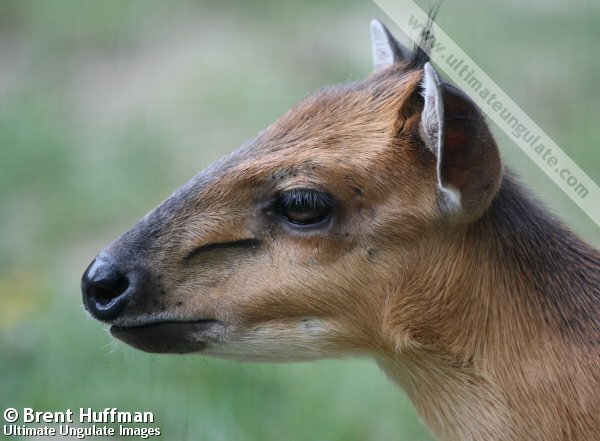 Similarly, Ogilby's duiker (Cephalophus ogilbyi) has a very thin, sharply-defined black dorsal stripe. 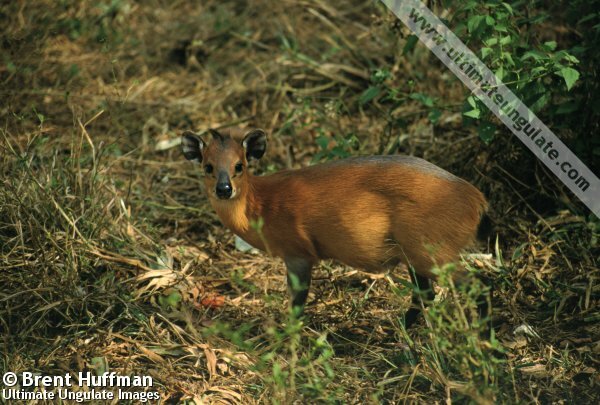 The white-bellied duiker (Cephalophus leucogaster) has a very wide black dorsal stripe that often has a scalloped edge. The dorsal stripe of Peters's duiker (Cephalophus callipygus) widens towards the tail, spreading out over the hindquarters. The black-fronted duiker (Cephalophus nigrifrons) and Weyns's duiker (Cephalophus weynsi) do not possess a distinct dorsal stripe. Sexual maturity: Females by 18 months. Young individuals have been seen in the wild during in the dry season or early wet season. After birth, the mother hides the infant in dense cover and returns only to nurse it. During this stage, the young will remain very still even when closely approached. 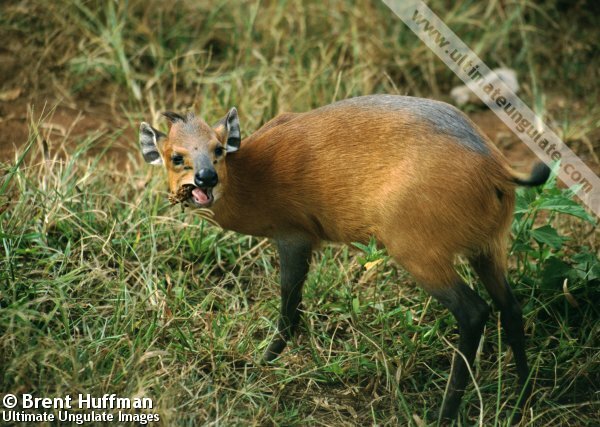 The red-flanked duiker is diurnal, but tends to be most active in the early morning and late afternoon. This species will often follow foraging primates (such as tantalus monkeys and baboons), feeding on the flowers, fruits, and vegetation that get dropped from the treetops. They are also able to stand upright on their hind legs to reach food that is above their normal reach. Typical of duikers, this species is shy and quickly flees into cover if alarmed. The alarm call is a shrill bark or loud snort. Red-flanked duikers occupy small home ranges that feature several resting places that are used regularly. Latrine areas also appear to be used. Home ranges are marked with secretions from the preorbital glands and usually do not overlap between individuals, but it is not agreed whether they are true territories. Population densities in areas of favorable habitat are estimated to be 3-4 animals per km2. Family group: Usually solitary, sometimes in pairs. Diet: Primarily leaves, also fruit, flowers, and twigs. Main Predators: Leopard, small cats, large raptors, pythons, and crocodiles. 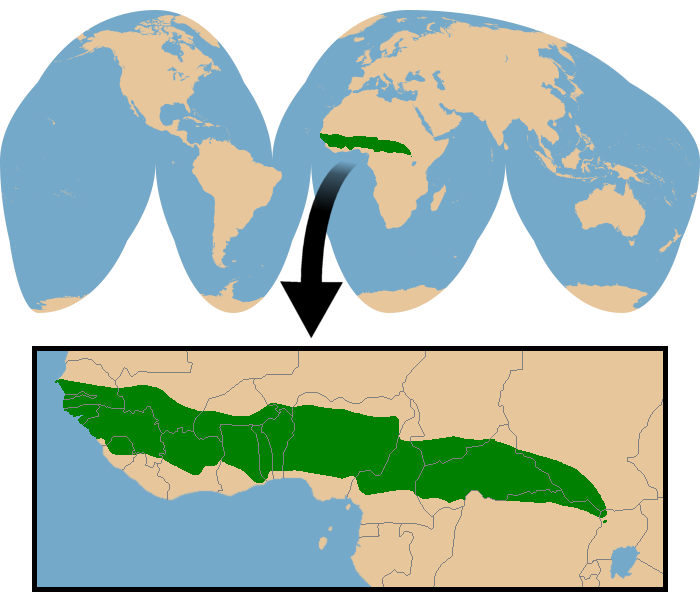 Red-flanked duikers are found in wooded savannas and riparian (river-side) forests in western and central Africa. They avoid dense forest. The approximate range is depicted in the map below. 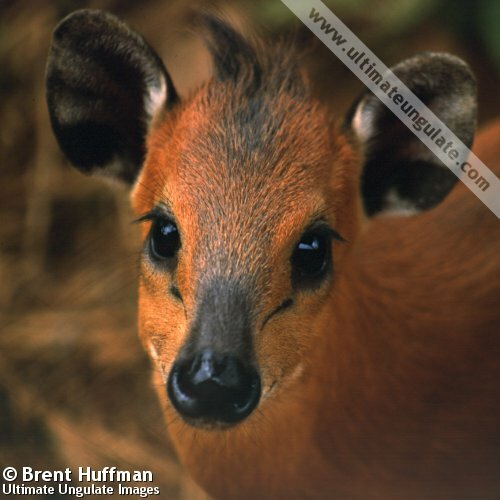 The red-flanked duiker is not as affected by habitat loss as forest-dwelling species, and may actually be increasing its range as mature rainforests are destroyed. It is still present across its historical range, with an estimated total population of 170,000 individuals.